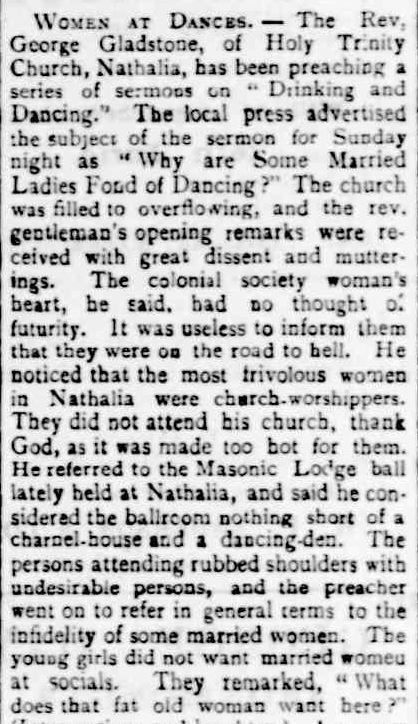 I found this article “Women at Dances” while searching for pioneer obituaries in the Portland Guardian, so I tagged it for a future Trove Tuesday post. That day has arrived. Today I introduce the preachings of Reverend George Gladstone of the Holy Trinity Anglican Church, Nathalia, Victoria. Surely he didn’t get away with that. Did he? Well, yes and no. While the Bishop of Melbourne stood by his man, the people of Nathalia wanted to run him out of town. That finding came from a search – George Gladstone Nathalia – at Trove. 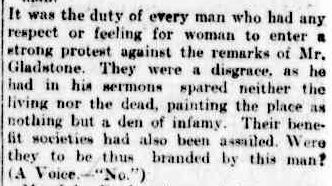 There were pages of search results specific to the Reverend and the implications of the June 1899 sermon reported in the Portland Guardian and beyond. A cry of “Horsewhip him” rang out as Mr W. McCormick had his say, indicating the Reverend’s sermons were receiving publicity around the world. A year on he was not leaving anyone alone. 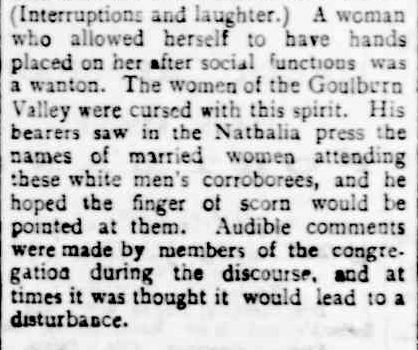 I was surprised to read that in 1907 George Gladstone was still in Nathalia and was still delivering sermons that led to riotous scenes. 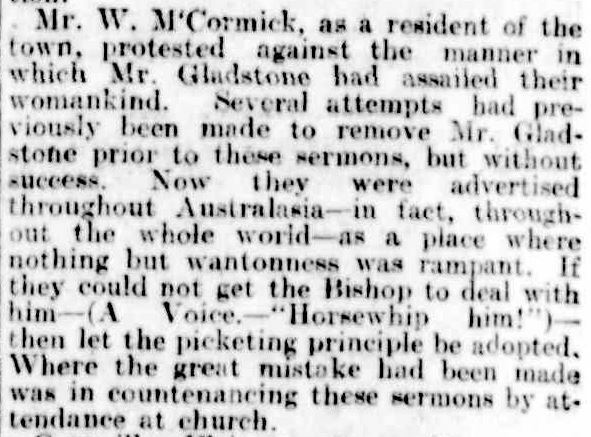 In 1908, it all ended up in the courts after the Bishop of Wangaratta revoked Gladstone’s license to preach. After failing in the courts, Gladstone attempted to set up his own religion, the Natalia Reformed Church of England. The Victorian Government refused to proclaim the religion. He passed away in 1916. I thought it was hilarious too. Clearly he had a Personality Disorder. I just hope there wasn’t a Mrs Gladstone. I do so hope and pray there really is an afterlife that the Rev is spinning like a top at the RAP culture (and everything else). Oh. Maybe he was totally correct after all.